Shining a small light on economic reality. All talk at the moment is of cut backs and job losses, but we should not let opportunities pass just because we are in a downturn. Today saw the announced closure of the 120 room Castletroy Park Hotel in Limerick. It is also felt that many more large hotels will close over the next few months as there is huge over-supply in the market. What to do with these assets? Turn them into modern hospitals. They have the same design as hospitals - reception, rooms, suites, kitchens, parking. It would require a major refit but most modern hotels are designed to be updated easily. Many of these are in excellent locations served by public transport. With a little investment they could be converted into some long-term care facilities. With a little extra some of them could become specialist care centres in key areas. Why should interest rates have a lower bound of zero? We've already seen that some UK mortgages may have negative rates shortly, but this was not by design and more a result of falling base rates. This is just another example of the deflation we are likely to see over the next 12 to 18 months. In a sense they could have just cut the price by €220 and offered a 0% APR finance deal. This would amount to the same thing. These suggest that over six years we will have to borrow in excess of 70 billion (provided the cumulative annual "adjustments" of €16.5 billion that have also been announced can be found over the same periods). However, our debt is low to begin with and our debt to GDP ratio is predicted to stabilise at around the 60% level. But what if we compare the deficits not to GDP (and one could argue that GNP would be a better measure for Ireland) but compare it to Government Revenue. The following ratios give Total Expenditure (Current and Capital) as a percentage of Total Revenue and also assume that annual "adjustments" aren't achieved. These are truly staggering. To quote one of our late Taoisigh "we are living beyond our means". To bring it to an individual level this is like someone with an income of €37,500 trying to maintain an expenditure level of over €60,000. Impossible! Government expenditure has become totally removed from government income. If by some chance the government does manage to find €16.5 billion in cumulative annual adjustments the ratio for expenditure to income will still be 123%. If you look at the adjustments from 2009 to 2013, the government is looking to cut projected expenditure (i.e. under current conditions) by a combined total of €48 billion over the five years. As to how this will be done. Nobody knows! The Irish banks are in crisis. Anglo has already been nationalised while AIB and BOI are also under pressure. One of the biggest problems is their loan books. It now appears that a large portion of the loans they have issued will turn out to be 'bad'. Estimates vary hugely but the bad debt provision for Anglo has been said to be between €20 and €30 billion. More precise figures would be nice! Anyway one issue that emerges is: Who has this money? These loans may never be repaid but it is real money that was given to someone. In the case of Anglo it seems that a lot of loans were issued to property developers. A lot of this money will have been spent. The biggest beneficaries will have been the land owners who sold the land to the developers. Construction workers, engineers, solictitors and others associated with the sector will also have got a share for work done. The government will also have taken in some through various taxes; stamps, capital gains, income, and VAT. These firms aim for different segments of the grocery market and it may be that Aldi sells inferior goods (in the economic sense) and Superquinn normal goods (again in the economic sense). An interesting study found similar results for Walmart and Target in the US using data from the two retailers. The paper can be read here with the title "Does Walmart Sell Inferior Goods?" The paper was written in April 2008 and WSJ reports in November on the two companies confirms the findings. For those looking for the meanings of the terms used above we can turn to wikipedia: Normal goods, Inferior goods, Luxury goods and the oft sought for but seldom found Giffen goods which have been traditionally (but incorrectly) associated with potatoes and the Famine times. Give me 2009!! Lower interest rates, unemployment and inflation, and all are substantially lower. Of course, it's not all sweetness and light. The Exchequer ran a deficit of 3.3billion in the last three months of 2008. It's the simplest concept in risk management and one that comes from the Grandmother Book of Wisdom but is one that tends to be ignored time and time again. At it's core is the principle that in order to reduce risk you should make more rather than fewer risky decisions - don't put all your eggs in one basket. HALF a century after he left the gardaí, John O’Leary still regrets taking the £89 he was offered in lieu of leaving his pension contributions with the force. But it was 1954 and he needed the money to pay his passage to England where he had hopes for a prosperous future. He did all right, getting a modest job with Beechams, but his only pension now comes from Britain and it’s a pittance, especially with the decline in sterling. That’s why, five years ago, he began taking whatever small savings he could muster and putting them into Anglo Irish Bank shares. Yesterday the 85-year-old from Cobh, Co Cork, all but accepted those shares were worthless. “Everything I read about them, everything I heard about them made them out to be a sound investment. Retired couple, Anne Louise and Charlie Moore, both aged 69 and living in Tullow, Co Carlow, said priority should be given to old age pensioners’ dividends in deciding how to continue the bank’s business. The first investor here had no diversification and is left with little or nothing. The second couple did have a number of different shares. Unfortunately, there were all companies in the same sector and as such were highly correlated. Owning these shares did nothing to reduce their risk. This isn't the first time the country has failed to grasp the concept of diversification. Due to EU laws requiring the opening up of the Irish telecommunications market, Telecom Éireann was privatised. The process began in 1995, and by July 1999 the government had disposed of virtually all of its shareholding. eircom plc was then floated on the Irish Stock Exchange, London Stock Exchange, and New York Stock Exchange on July 8, 1999 and small/first-time investors were encouraged by the government to buy shares. The government undertook a huge advertising campaign encouraging people to buy shares. This was to try and increase stock market participation among the general population. More the 500,000 participated in the initial public offering. The share price was set at €3.90. It later reached a high of €4.80, a 23% increase. Those initial investors that held onto their shares until July 2000 received a 4% bonus share allocation. However after the initial hype of the flotation died down, the stock price fell rapidly. Eventually in November 2001 the company agreed a recommended offer of €1.335 per share from the Valentia Consortium headed by Tony O'Reilly. Many of the 500,000 small investors were angered by the significant financial loss they incurred, blaming the government for not sufficiently warning them of the risks inherent in stock market investment. They had all their eggs in one basket! The next occasion when Irish government policy was linked to general participation in stock markets was with the launch of the Special Savings Investment Accounts in 2001. People who signed up for the scheme had a choice of three types of account. The accounts are listed in increasing order of riskiness. After being burned on the eircom privatisation people were less willing to go for the equity accounts. In fact less than 25% of the more than one million accounts opened were equity based. Although the equity accounts performed poorly in the early years of the scheme by the end of the scheme they had outperformed the interest bearing accounts. The following data on the final values of the accounts is taken from this report. Bank of Ireland provide a similar analysis here. The managed equity fund was nearly 25% higher than both of the cash based accounts. They didn't put all their eggs in one basket! Previously we worked out that the fall in petrol prices compared to 2008 was saving drivers about €400 million a year. Since then the price of petrol has fallen a further 6% to around €0.94 per litre and is now at a four year low. As Steven Landsburg put it "economics can be summarised by just four words: 'people respond to incentives'. All the rest is just commentary". Expectant parents are people too and when faced with incentives they will respond too. You might think that economics and incentives have nothing to do with the natural process of birth, but how wrong you could be. Two examples show that when faced with simple monetary incentives expectant parents will either accelerate or delay the birth of their new baby. The first example comes from the US and is reported here. Since the early 1990s the federal government has been steadily increasing the tax breaks for having a child. For parents to claim the full amount of anyof these breaks in a given year, a child must simply be born by 11:59 p.m. on Dec. 31. If the baby arrives a few minutes later, the parents are often more than a thousand dollars poorer. about 5,000 babies, of the 70,000 or so who would otherwise be born during the first week in January, may have their arrival dates accelerated partly for tax reasons. On 11 May 2004, Peter Costello brought down the budget in which he urged Australian families to have “one for mum, one for dad, and one for the country”. And because Treasurers can put their money where their mouth is, he promised that every baby born on or after 1 July 2004 would receive a $3000 Baby Bonus. the 1st July, 2004, had the most number of births in a single day over the entire 30 years of data we had (almost 11,000 days). The 2nd July was no slouch either, being the 7th highest day. This was a big effect. We've heard of negative real interest rates (RIR) when the interest rate is below the inflation rate. Borrowers like a negative RIR as the real value of their debt is falling. For the same reason savers dislike a negative RIR as the real value (purchasing power) of their savings is declining; prices are rising faster than they are earning interest. But what happens when the nominal interest rate (NIR) is negative. When depositing money at a negative NIR it is like paying a storage cost. This has already happened. Investors accepted the zero percent rate in the government’s auction Tuesday of $30 billion worth of short-term securities that mature in four weeks. Demand was so great even for no return that the government could have sold four times as much. In addition, for a brief moment, investors were willing to take a small loss for holding another ultra-safe security, the already-issued three-month Treasury bill. In the rush to safety investors were willing to pay the US Treasury to store their money. Would financial institutions be willing to give their money to everyday people to store? This may be about to happen in the UK mortgage market. It seems likely that mortgage rates for some customers may turn negative in the next few months. This will happen because in the rush to lend money of the last few years some lenders offered tracker mortgages at fixed margins below the Bank of England's base rate. See BBC report here. These offers were only available for a short period and the most generous of them was Cheltenham and Gloucester's BOE - 1.01%. With the base rate at 1.50% another 50 basis points fall means that the interest rate on these mortgages will be negative. Cheltenham and Gloucester will be paying interert to those customers who are on this rate. It is as if they have given the money to their customers and are paying them storage costs. If the BoE decide to follow the US and move to ZIRP (zero interest rate policy) the mortage rate on these mortage will be minus 1.01%. A borrower could pay off a quarter of their mortage in 25 years by doing nothing! The banks haven't announced what they will do if this situation arises so they may find some small print to prevent the negative mortgage rates. These were only introductory offers that have a fixed period the longest of which is three years. After this period the loans switch to the banks' standard variable rates. Rest assured these will never be zero. Still it highlights just how unexpected this financial crisis or "credit crunch" was. These loans were offered in July 2007 just weeks before the turmoil began towards the end of that summer. Recovery will arise from the discrete decisions and actions of thousands of business people, entrepreneurs, bank managers and workers deciding they are hopeful for the future and prepared to take the risk of borrowing/lending, investing and hiring to meet the needs they foresee. It is not up to Government or economists or the Social Partners to bring about growth: they just have to get out of the way of those who will. Jobs are always available. In fact, each of us has so many potential jobs that we can't possibly do all of them. Paint the house, clean the garage, cut the lawn. The list is endless. Trouble is, few of these jobs pay very much. We must understand that jobs are a cost, not a benefit. That is, what each of us wants is not the job itself -- the obligation to toil and sweat -- but, rather, we want the income available from working the job. In short, we want income-earning opportunities. The economist understands, therefore, that the value of paid employment depends on the economy's productivity. If the economy is producing lots of goods and services that people find attractive, then each paying job will be worth more than if the economy's output is meagre or unattractive. Even the best jobs in a primitive society afford a level of well-being that every modern personwould find unbearably deficient. We now enjoy access to a range and quality of goods and services that were undreamed of by our grandparents. We enjoy this access because our economy is so dynamic and productive. Unfortunately, economic dynamism is commonly condemned. When a new spark of dynamism enables machines to perform tasks once requiring human muscle, or when an overseas source of supplies or labour opens up, politicians, pundits, and reporters focus on the resulting loss of domestic jobs. "It's awful!" some cry. "We need subsidies, incentives and other policies to stop this sort of thing!" demand others. And so, too, are our lives better as workers. When decades ago the prospects of earning a good living on the farm fell, the farmer wondered anxiously how his grandchildren would earn their livings. He could not have known that some would work for companies called Dell, Google and Eli Lilly, while others would be free-lance Web designers working out of their flats in Blackrock. These jobs would never have existed had not human creativity and energy been freed from older occupations. The jobs that permeate the modern economy are created by our freedom as consumers to spend our money as each of us sees fit -- including our freedom to change how we spend our incomes -- combined with our freedom as entrepreneurs to create new spending opportunities. If this dynamic process of consumer freedom and entrepreneurial experimentation were stopped in an attempt to freeze all existing jobs into place, the very logic of our economy would go haywire. Rewards to entrepreneurism would disappear and consumers would be locked forever into an unchanging pattern of buying the same things year after year, decade after decade. With profit-seeking and consumer sovereignty abolished, our jobs might be more secure. They also would be pitiful. Then they'll tear it down. There has been a minor furore over an allowance of €41,000 that Beverley Cooper-Flynn has been receiving for being an "independent" TD. See here and here. Of course, Cooper-Flynn is not an independent TD but she was at the time of her election and hence is entitled to the allowance for the duration of the current Dail. The allowance is to cover the expenses of a constituency office for the independent TD. This highlights a key deficiency of the system of government in Ireland - "all politics is local". Why are we giving €41,000 to a TD just because they are not aligned to a political party? People respond to incentives and this allowance serves as an incentive for independents to run on single issue campaigns. Although these are in the interests of the people of the constituency where they are elected, this does not nesessarily hold for the country as a whole. The issues that lead to the election of many independents should be dealt with within local government and not brought to a national level. Its is also possible that one or two constituencies can benefit in special packages by the presence of having an independent TD who agrees to support a minority or slim majority government. This has been the case for the last two governments in Ireland. The late independent TD, Tony Gregory has been getting huge plaudits for doing great work for his inner city Dublin North Central constituency. He may have been good for the people of Dublin North Central but he will be remembered in the country as a whole for his most famous "deal" which kept one Charles J. Haughey in power in 1982. People respond to external incentives and do so to best meet their internal self-interest. The self-interest that drives politicians is very simple - get reelected. The small multi-seat constituencies in Ireland and election quotas of around 10,000 votes lead to what has been stylised as "parish pump" politics. This means that decisions are made in the local rather than national interest. If I could make one change in the political system I'd give everybody two votes per election. You'd cast one vote in your own district and the other in the district of your choice. When a West Virginia senator manages to convert billions of federal tax dollars into pork for his home state, I want him to know that the suppliers of those dollars will have an opporunity to gang up against him on election day. The problem with democracy is not that politicians kowtow to financiers and lobbyists; its that politicians kowtow to their own constituents, spending other people's money along the way. In other words, the problem is that politicians have little incentive to consider the costs of their actions. Effective reform should supply that incentive. So for my next reform, I'd redraw the boundaries of congressional districts according to the alphabet instead of geography. Instead of congressmen from central Delaware and northern Colorado, we'd have a congressman for everyone whose name starts with AA through AE, another for AF through AH, and so on. This would make it harder for representatives to bring home the pork. It's easy to invent a project that transfers income to a particular region, but much trickier to concoct a scheme that transfers income precisely to those people whose names happen to begin with Q. This reform has an important side benefit: congressmem would no longer be able to maintain local offices to provide constituent services, like assistance with cutting through regulatory red tape. A lot of that red tape exists only so that politicians can win points by cutting through it. Maybe after doing that we should consider abolishing the need to form the cabinet from the elected TDs in the Dail. Lets get experts in the relevant areas to run the Departments. Since 1997 Cork TD Michael Martin has been Minister for Education and Science, Minister for Health and Children, Minister for Enterprise, Trade and Employment and Minsiter for Foreign Affairs. That's a lot of expertise. There would still be the Dail where the elected TDs would be required to vote on any legislation proposed, however its makeup regarding party/independent would not be as relevant and certainly €41,000 non-party payments would not be required. It is estimated that the ecomonic stimulus packages announced by governments around the world will require the raising of some €2 trillion to fund them. This will require governments selling bonds to raise the money. The FT reports that this may put a squeeze on developing countries looking to raise money. A second consequence is that this huge increase in the demand for money will cause the price of money (i.e. interest rates) to go up. If countries want to get money from lenders they will have to offer higher interest rates. This is at the same time that countries through their central banks are trying to get interest rates down. At present interest rates on bonds are low as those with money are involved in the "flight to safety". Over time though this money will dry up and it is also possible that doubts about the ability of some countries to repay may force the rates up. The money has to come from somewhere. If you raise taxes to fund the plan, the people who are taxed are poorer and they'll spend less. If you borrow money to fund the plan, the people who buy the government bonds have less money to spend and that offsets the stimulus. It's like taking a bucket of water from the deep end of a pool and dumping it into the shallow end. Funny thing—the water in the shallow end doesn't get any deeper. Before government can inject money/spending into the economy, it first must take money out of the economy (borrow or tax), so the net result can never be anything more than a redistribution, shifting and transfer of income/spending from one group to another. 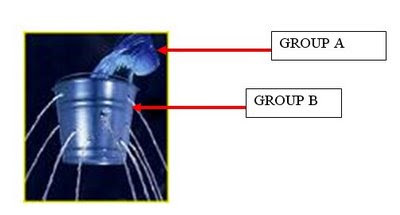 Kind of like transferring water from Group A to Group B, but with a leaky bucket. That's why stimulus schemes based on giving people money have a poor track record of energizing the economy. Usually, the only thing that gets stimulated is a politician's approval rating. Back in October of last year the House of Representatives in the US voted on the "Bailout Bill" for the subprime crisis. The Bill was rejected. Five days later, they voted again. This time the bill was passed. What caused the change in the result? Here are some of the additions that were made to the bill. Sec. 101. Renewable energy credit. Sec. 104. Energy credit for small wind property. Sec. 106. Credit for residential energy efficient property. Sec. 107. New clean renewable energy bonds. Sec. 108. Credit for steel industry fuel. Sec. 109. Special rule to implement FERC and State electric restructuring policy. Sec. 114. Special rules for refund of the coal excise tax to certain coal producers and exporters. Sec. 116. Certain income and gains relating to industrial source carbon dioxide treated as qualifying income for publicly traded partnerships. Sec. 117. Carbon audit of the tax code. Division C, SEC. 503. Exemption from excise tax for certain wooden arrows designed for use by children. I kid you not! All of these countries are engaged in economic stimulation. All they are doing is moving money around - it has to come from somewhere. And when they get it they spend it in ways that please them. For example, the Irish government has announced a multi-billion recapitalisation plan for the banks. Included in the plan is the provision that each bank use €100 million of the funds to be made available for "green projects" - it looks like our buckets are leaking too! Sales of houses in Ireland have virtually ground to a standstill. This can be seen by the fact the mortgage debt grew by only €24 million in October and €96 million in November. This compares with an average monthly increase of €850 million between January and September 2008 and monthly increases of over €2 billion during 2006. A lot of this can be explained by falling house prices as new entrants are waiting for the further anticipated falls. However there is also likely to have been a collapse in those trading up or down. House prices shouldn't have a huge effect on people moving as when prices are high they sell high and buy high and when prices are low they sell low and buy low so there may not be a huge difference in the final net position. Stamp duty is one reason that increases the cost of moving. Another could be the cost of refinancing. Over the past few years tracker mortgages have been increasingly popular with more the two thirds of new mortgages on tracker rates. These have commonly been set at ECB + 1.0% with some as low as ECB + 0.5%. If somebody has an existing mortgage at ECB + 0.75% and wishes to move in the current climate they will not be able to get a mortgage at anything close to that rate. There are no tracker mortgages being offered now and most standard variable rates for new mortgages are roughly 2% above the ECB rate. Current rates are available here. For example a twenty year €300,000 tracker mortgage at ECB +0.75% would have a monthly repayment of about €1,700. If the person moved and again has a twenty year €300,000 but this time on a standard variable rate of 4.5% the monthly repayment is close to €1,900. That is €200 extra a month or €48,000 over the lifetime of the mortgage. That along with a €20,000 stamp duty bill makes moving house a far from attractive option. The monopoly of Sky Sports in broadcasting live games from the English Premier League was broken up as a result of a 2006 ruling from the European Commission. This saw Irish company, Setanta Sports, enter the market in August of that year who along with Sky Sports paid a total of £1.7 billion for six "packages" over three years. Sky purchased four of the packages and Setanta two. In the most recent three year deal Sky to secured five of the packages to Setanta's one. But has this really put a dent in the monopoly power the ruling sought to reduce? When it comes to each match the broadcaster of that game is still a monopoly. The same match is never shown live by both companies. If a viewer wants to watch a particular game there is still no choice. The viewer faces a monopoly. How much would it cost to watch these 138 games? In the one monopoly regime the consumer pays a monthly fee of about €30 for the Sky Sports package and could buy a "season ticket" for PremPlus for about €80. This gives a total annual outlay of (12 x €30) + €80 = €440. With the current two monopoly regime the consumer pays a monthly fee to both Sky Sports (c. €30) and Setanta Sports (c. €18). This gives a total annual outlay of (12 x €30) + (12 x €18) = €576. Is there any hope for Rent Pressure Zones? Good News on the Economy from Europe but a Warning?